Neal Dodge's report on the 2018 Central Council Annual Meeting added to the News menu. Updated NW District programme for 2019 added to the News menu and to The Guild, NW District menu. Proposed Rule changes item added to the News menu. AGM Agenda added to The Guild, Agenda page and draft 2018 AGM minutes added to The Guild, Minutes, Annual General Meetings page. Revised List of Guild grants awarded from 2014-2018 added to the Grant Awarded item of the Restoration & Maintenance menu tab. Trustees' Annual Report for 2018 added to The Guild, Trustees' Annual Reports page and the Accounts & Independent Examiner's Report for 2018 added to the Accounts & Independent Examiner's Report page (on the Guild menu). Approved GMC minutes for 20/10/2018 and draft minutes for 9/2/2019 added to the Guild, Minutes, Management Committee menu. Guild Annual Report 2018 & Handbook for 2019 added to the The Guild, Annual Reports, Current and to the The Guild, Annual Reports, Old Reports menus. Links to the Mancroft Ringing Discovery Centre and to its What's On added to the News, Ringing and Recruitment & Training menus. 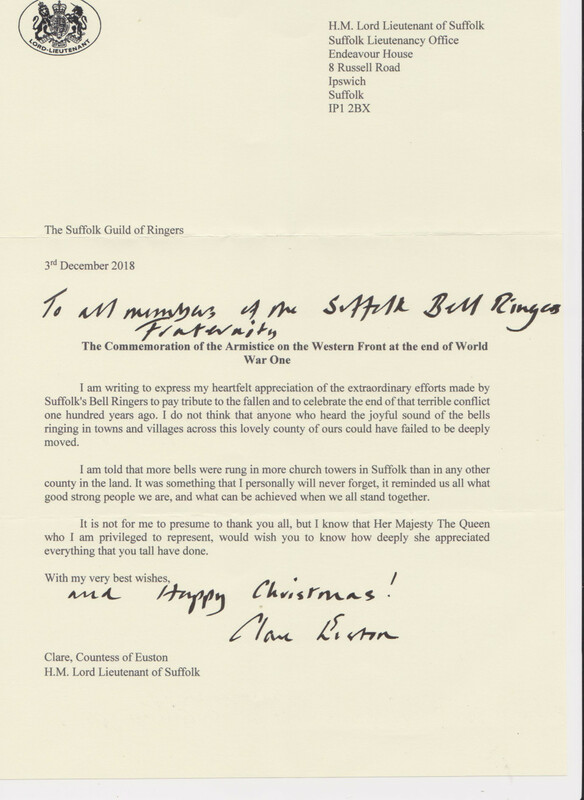 Letter received from the Lord-Lieutenant thanking Suffolk Bellringers for their efforts to pay tribute to the fallen and to celebrate the end of The First World War. 2018 Guild Quarter Peal Analysis added to the Quarter Peals page on the Ringing menu. A comprehensive range of clothing is now available, personalised with the Guild logo. A Suffolk Guild Clothing page has been added to The Guild menu tab. List of Guild grants awarded from 2014-2018 added to the Grant Awarded item of the Restoration & Maintenance menu tab. NW District Annual Meeting 13/10/2018 minutes added to The Guild, NW District, Minutes menu. NW District Meeting 12/1/2019 Agenda added to The Guild, NW District, Agenda menu. SW District programme for 2019 added to the News menu and to The Guild, SW District menu and to What's On. Approved GMC minutes for 10/6/2018 and draft minutes for 20/10/2018 added to the Guild, Minutes, Management Committee menu. NW District programme for 2019 added to the News menu and to The Guild, NW District menu. Draft minutes of the SE Annual District Meeting, 1/12/2018, added to the The Guild, SE District, Minutes page. Finalised Agenda for the SE Annual District Meeting, 1/12/2018 added to the The Guild, SE District, Agenda page and Officers' reports added to the The Guild, SE District, Reports page. Minutes of the Recruitment & Training Committee meeting held on 7/10/2018 added to the R&T Minutes page. SE Distrct Ringing Master's Report for 2017 addded to the The Guild, SE District, Reports page. Minutes of the SE Annual District Meeting, 3/12/2017, added to the The Guild, SE District, Minutes page and Agenda for the SE Annual District Meeting, 1/12/2018 added to the The Guild, SE District, Agenda page. Updated Chairman's Tour Dates 2018-19 page added to the News and The Guild menus. NW District programme for 2018 - 19 added to the News menu and to What's On. Minutes of the Recruitment & Training Committee meeting held on 1/7/2018 added to the R&T Minutes page. Agenda for GMC Meeting on 201/10/2018 added to The Guild, Agenda, General Management Committee menu. Trustees' Annual Reports for 2017, 2016, 2015, 2014, 2013 & 2007 added to The Guild, Trustees' Annual Reports page. Approved GMC minutes for 17/2/2018 and draft minutes for 10/6/2018 added to the Guild, Minutes, Management Committee menu. The Guild Annual Reports for 2015, 2016 & 2017 and 2015 - 2017 added to the Guild, Annual Reports, Old Reports, Annual Reports page and to the Guild, History, Annual Reports page. All reports from 1923 - 2004, 2015, 2016 & 2017 are now available online. Minutes of the Belfry Advisory Committee meeting held on 7/2/2018 added to the BAC Minutes page. Accounts & Independent Examiner's Report for 2017 added to the Accounts & Independent Examiner's Report page (on the Guild menu). Revised draft 2018 AGM minutes added to The Guild, Minutes, Annual General Meetings page. Updated Insurance Synopsis, Public Liability Insurance schedule, Personal Accident Insurance schedule and Handbell Insurance schedule added to The Guild, Membership, Insurance and to The Guild, Insurance menus. Updated SW District programme for 2018/19 added to the News menu,The Guild, SW District menu and to What's On. Draft minutes of the NE District Meeting held on the 12th May 2018 added to The Guild, NE District, Minutes menu. Guild Striking Competitions results added to the News menu and to the Ringing, Competition Results page. Approved GMC minutes for 22/10/2017 added to the Guild, Minutes, Management Committee menu. Draft 2018 AGM minutes added to The Guild, Minutes, Annual General Meetings page. Draft GMC minutes for 17/2/2018 added to the Guild, Minutes, Management Committee menu. Revised SW District programme for 2018 added to the News menu and to What's On. SE District Striking Competitions results added to the News menu. Draft minutes of the NE Annual District Meeting held on the 11th November 2017 and of the Quarterly Meeting held on 10th February 2018 added to The Guild, NE District, Minutes menu. Agenda for the NE Quarterly District Meeting to be held on 12th May 2018 added to The Guild, NE District, Agenda menu. Meet the Chairman and Chairman's Tour Dates pages added to the News and The Guild menus. Notice of memorial service for Don Mills of Bures added to the News menu. Revised NW District programme for 2018 added to the News menu and to What's On. Corrected AGM Agenda (venue corrected) added to The Guild, Agenda page. AGM Agenda added to The Guild, Agenda page and draft 2017 AGM minutes added to The Guild, Minutes, Annual General Meetings page. 2017 Guild Quarter Peal Analysis added to the Quarter Peals page on the Ringing menu. Recruitment & Training Committee minutes for 4/3/2018 added to the Training, R&T Committee, Minutes and to the Guild, Minutes, Recruitment & Training Committee menus. Derek Roses's tribute to Arthur Finch RIP added to the News menu. Minutes of the Belfry Advisory Committee meeting held on 3/10/2017 added to the BAC Minutes page. NE District 2018 programme added to the News menu and to the Guild, NE District menu. Updated (February 2018 revision) Safeguarding page added to the Recruitment & Training and The Guild menus. Draft minutes of the NE Annual District Meeting held on the 11th November 2017 added to The Guild, NE District, Minutes menu. Agenda for the NE Quarterly District Meeting to be held on 10th February 2018 added to The Guild, NE District, Agenda menu. New page of teaching Resources for Learners and Teachers added to the Recruiting & Training, Resources for Learners and Teachers menu. List of members of the R&T Committee updated. Recruitment & Training menus rearranged. Confirmed GMC minutes for 15/10/2016 added to the Guild, Minutes, Management Committee menu. Minutes of the SE Annual District Meeting, 3/12/2016, added to the The Guild, SE District, Minutes page. GMC minutes for 18/2/2017 & 17/6/2017 and draft minutes for 22/10/2017 added to the Guild, Minutes, Management Committee page. Recruitment & Training Committee minutes for 5/11/2017 added to the Training, R&T Minutes and to the Guild, Minutes, Recruitment & Training Committee menus. SE District Chairman's Report for 2017 addded to the The Guild, SE District, Reports page. SE Annual District Meeting agenda addded to the The Guild, SE District, Agenda page. Tower Correspondent for Ipswich, St Clement updated and Ipswich, St Stephen now marked as unringable. Links to the Ipswich Historic Churches Trust added to St Clement, St Lawrence and St Stephen, and to the Links page. Updated Safeguarding page added to the Recruitment & Training and The Guild menus. Minutes of the Belfry Advisory Committee meeting held on 12/6/2017 added to the BAC Minutes page. Minutes of the Belfry Advisory Committee meeting held on 3/2/2017 added to the BAC Minutes page. Recruitment & Training Committee minutes for 2/7/2017 added to the Training, R&T Minutes and to the Guild, Minutes, Recruitment & Training Committee menus. Searchable versions of all the Guild Annual Report from 1923 to 2004 have been added to the Guild, Annual Reports, Old Reports, Annual Reports page and to the Guild, History, Annual Reports page. The Guild Annual Report for 2004 added to the Guild, Annual Reports, Old Reports, Annual Reports page and to the Guild, History, Annual Reports page. All reports from 1923 - 2004 are now available online. Accounts & Independent Examiner's Report for 2016 added to the Accounts & Independent Examiner's Report page (on the Guild menu). Final final confirmed SW Open Towers list, with full details, for Bank Holiday Monday added to What's On. Final confirmed SW Open Towers list, with full details, for Bank Holiday Monday added to What's On. Updated insurance Policy Schedules for 2017 added to The Guild, Insurance menu. Draft minutes of the NE District Meeting held on the 13th May added to The Guild, NE District, Minutes menu. SW Open Towers list for Bank Holiday Monday added to What's On. Neal Dodge's report on the recent Cental Council annual meeting added to the News menu. Latest version of the Suffolk Guild Learning to Ring leaflet added to the The Guild, Publicity & Recruitment Material menu. Insurance Policy Schedules for 2017 added to The Guild, Insurance menu. Richy's Blog for Wednesday 21st added. Guild Striking Competitions results added to the News menu. Publicity & Recruitment Material page added to the Recruitment & Training, The Guild and the Resources menus. Amended Guild Constitution (2017 revision) added to The Guild menu. Draft 2017 AGM minutes and confirmed 2016 AGM minutes added to The Guild, Minutes, Annual General Meetings page. Learning to Ring Leaflet added to the Training menu. The Guild Annual Report for 2003 added to the Guild, Annual Reports, Old Reports, Annual Reports page and to the Guild, History, Annual Reports page. All reports from 1923 - 2003 are now available online. Quarter Peals page added to the Ringing menu. Recruitment & Training Committee minutes for 5/3/2017 added to the Training, R&T Minutes menu. Link to AGM agenda added to What's On for 22nd April. Draft GMC minutes for 18/2/2017 added to the Guild, Minutes, Management Committee menu. Details of the of the arrangements for the AGM added to What's On. Revised Grant Terms & Conditions added to the Restoration & Maintenace menu. NE District 2017 programme added to the News menu and to the Guild, NE District menu. Minutes of the Belfry Advisory Committee meeting held on 6/10/2016 added to the BAC Minutes page. Confirmed GMC minutes for 18/6/2016 and draft minutes for 15/10/2016 added to the Guild, Minutes, Management Committee menu. 2017 Membership Application Form added to the The Guild, Membership menu. Accounts & Independent Examiner's Report for 2015 added to the Accounts & Independent Examiner's Report page (on the Guild menu). List of Recruitment & Training Committee members and R&T minutes added to the Training menu. Draft minutes of the 2016 NE District Annual Meeting added to the The Guild, NE District, Minutes menu. Minutes of the SE District Annual Meeting, 5/12/2015, added to the The Guild, SE District, Minutes page. Minutes of the Belfry Advisory Committee meeting held on 8/6/2016 added to the BAC Minutes page. The Guild Annual Report for 2002 added to the Guild, Annual Reports, Old Reports, Annual Reports page and to the Guild, History, Annual Reports page. All reports from 1923 - 2002 are now available online. The Guild Annual Report for 2001 added to the Guild, Annual Reports, Old Reports, Annual Reports page and to the Guild, History, Annual Reports page. All reports from 1923 - 2001 are now available online. Minutes of the Belfry Advisory Committee meeting held on 1/2/2016 added to the BAC Minutes page. Insurance Policy Schedules added to The Guild, Insurance menu. Draft GMC minutes for 18/6/2016 added to the Guild, Minutes, Management Committee menu. Safeguarding page updated and the Guild Safeguarding Statement & Policy document added. Peter Harper's report on the Central Council Annual Meeting added to the News menu. Guild Annual Report for 2000 added to the Guild, Annual Reports, Old Reports, Annual Reports page and to the Guild, History, Annual Reports page. All reports from 1923 - 2000 are now available online. Confirmed GMC minutes for 17/10/2015 and draft GMC Minutes for 20/2/2016 added to the Guild, Minutes, Management Committee menu. 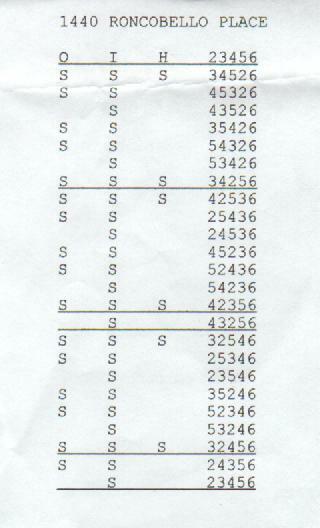 Results of the SE District Striking Competitions added to the Ringing, Competitions and News menus. Guild Annual Reports for 1998 ad 1999 added to the Guild, Annual Reports, Old Reports, Annual Reports page and to the Guild, History, Annual Reports page. All reports from 1923 - 1999 are now available online. Draft minutes of the 2016 Guild AGM added to The Guild, Minutes, Annual General Meetings page. Minutes of the 2015 Guild AGM added to The Guild, Minutes, Annual General Meetings page. Guild Annual Report for 1997 added to the Guild, Annual Reports, Old Reports, Annual Reports page and to the Guild, History, Annual Reports page. All reports from 1923 - 1997 are now available online. Guild Annual Report for 1996 added to the Guild, Annual Reports, Old Reports, Annual Reports page and to the Guild, History, Annual Reports page. All reports from 1923 - 1996 are now available online. Guild Annual Reports for 1993 & 1994 added to the Guild, Annual Reports, Old Reports, Annual Reports page and to the Guild, History, Annual Reports page. Guild Annual Report for 1995 added to the Guild, Annual Reports, Old Reports menu and to the History, Annual Reports page. Minutes of the Belfry Advisory Committee meeting held on 6/10/2015 added to the BAC Minutes page. Draft GMC Minutes for 17/10/2015 added to the Guild, Minutes, Management Committee menu. Guild Annual Report for 1929 added to the Guild, Annual Reports, Old Reports menu and to the History, Annual Reports page. All the reports from 1923 to 1992 are now online. These were all digitised by Neal Dodge - no mean feat; more to folow. SE District Quarter Peal Fortnight page added to the News menu. Guild Annual Report for 1928 added to the Guild, Annual Reports, Old Reports menu and to the History, Annual Reports page. Guild Annual Reports for 1926 & 1971 added to the Guild, Annual Reports, Old Reports menu and to the History, Annual Reports page. Minutes of the Belfry Advisory Committee meeting held on 3/6/2015 added to the BAC Minutes page. Guild Annual Report for 1986 added to the Guild, Annual Reports, Old Reports menu and to the History, Annual Reports page. Guild Annual Reports for 1924 & 1925 added to the Guild, Annual Reports, Old Reports menu and to the History, Annual Reports page. Guild Annual Report for 1966 added to the Guild, Annual Reports, Old Reports menu and to the History, Annual Reports page. Guild Annual Reports for 1964 and 1991 added to the Guild, Annual Reports, Old Reports menu and to the History, Annual Reports page. Draft GMC Minutes for 21/6/2015 added to the Guild, Minutes, Management Committee menu. Guild Annual Report for 1990 added to the Guild, Annual Reports, Old Reports menu and to the History, Annual Reports page. Three new R&T notes added to the Training, Ringing Tips menu: Learning methods - first steps, Learning methods - next steps and Learning Styles Questionnaire. Report of Young Ringers' Practice at Ufford on the 5th added to the Young Ringers' News page on the News menu. Report of the Maintenance Get Together added to the News and Restoration & Maintenance menus. Lavenham Ringers jigsaw added to the News menu. GMC Minutes for 21/2/2015 added to the Guild, Minutes, Management Committee menu. Minutes of the Belfry Advisory Committee meeting held on 3/2/2015 added to the BAC Minutes page. Guild Annual Reports for 1981, 1982, 1984 and 1988 added to the Guild, Annual Reports, Old Reports menu and to the History, Annual Reports page. Jed Flatter's report of the 2015 Ridgman Trophy added to the News menu. Guild Annual Report for 1962 and 1970 added to the Guild, Annual Reports, Old Reports menu and to the History, Annual Reports page. Results of the Guild Striking Competitions added to the Ringing, Competitions menu. New Young Ringers' events added. Results of the NE District Striking Competitions added to the Ringing, Competitions menu. Results of the SE District Striking Competitions added to the Ringing, Competitions menu. List of Rose Trophy winners added to the The Guild, History menu. Report of Young Ringers' Practice at Offton on the 26th added to the Young Ringers' News page. SE District Striking Competition Rules added to the Ringing, Competitions menu and to the The Guild, SE District menu. Guild Annual Report for 1953 added to the Guild, Annual Reports, Old Reports menu and to the History, Annual Reports page. Guild Annual Reports for 1954 and 1955 added to the Guild, Annual Reports, Old Reports menu and to the History, Annual Reports page. Photo (with key) of Guild members taken at the AGM at Felixstowe added to The Guild/History/AGM Photo 2015 menu. Issue 16, Spring 2015 of the Guild Magazine, Awl a'huld added to the Guild Magazine page. Guild Annual Report for 1980 added to the Guild, Annual Reports, Old Reports menu and to the History, Annual Reports page. Guild Annual Reports for 1983 and 1989 added to the Guild, Annual Reports, Old Reports menu and to the History, Annual Reports page. Accounts & Independent Examiner's Report for 2014 added to the Accounts & Independent Examiner's Report page (on the Guild menu). Guild Annual Report for 1992 added to the Guild, Annual Reports, Old Reports menu and to the History, Annual Reports page. Minutes of the 2014 Guild AGM added to the AGM minutes page. Minutes of the Belfry Advisory Committee meetings held on 6/2/2014, 4/6/2014 & 1/10/2014 added to the BAC Minutes page. Issue 15, Winter 2014 of the Guild Magazine, Awl a'huld added to the Guild Magazine page. Draft GMC Minutes for 18/10/2014 added to the Guild, Minutes, Management Committee menu. GMC Minutes for 15/6/2014 added to the Guild, Minutes, Management Committee page. GMC Minutes for 15/2/2014 added to the Guild, Minutes, Management Committee page. Young Ringers' events added to What's On. Guild Annual Reports for 1937 & 1985 added to the Guild, Annual Reports, Old Reports menu and to the History, Annual Reports page. Guild Annual Reports for 1927, 1930, 1931, 1934 - 35 & 1936 added to the Guild, Annual Reports, Old Reports menu and to the History, Annual Reports menu. Issue 14, Summer 2014 of the Guild Magazine, Awl a'huld added to the Guild Magazine page. Guild Annual Reports for 1952, 1957, 1958, 1959, 1960, 1961, 1963, 1965, 1969, 1968 & 1967 added to the Guild, Annual Reports, Old Reports menu and to the History, Annual Reports menu. Statistics page for Jed and Rowan's Ring Around the Guild added to the News menu. George Salter & Neal Dodge's report of the Ringing World National Youth Contest added to the News menu. Tom Scase's report on the SE District Quarter Peal Evening added to the News menu. Guild Annual Reports for 1923, 1950 & 1951 added to the Guild, Annual Reports, Old Reports menu and to the History, Annual Reports menu. Wow, this is fantastic and a real feast for anyone interested in the history of The Guild. A wonderful fount of knowledge! Guild Annual Reports for 1939, 1940 - 45, 1946, 1947, 1948, 1949, 1956, 1972, 1973, 1974, 1975 & 1976 added to the Guild, Annual Reports, Old Reports menu and to the History, Annual Reports menu. All these reports have been scanned and digitised by Neal Dodge. Two reports, one by Peter Harper and one by George Salter, on the Central Council Annual Meeting added to the News, CCCBR Annual Meeting Reports 2014 menu. Jed Flatter's report on Saturday's Ridgman Trophy added to the News menu. Report of Young Ringers' Practice in Felixstowe on the 27th added to the Young Ringers' page. Results of the Guild Striking Competitions added to the News menu and to the Ringing, Competitions menus. Results of the NE District Striking Competition added to the News menu and to the Ringing, Competitions menus. Results of the SE District Striking Competitions added to the News menu and to the Ringing, Competitions menus. Stoke by Nayland is holding practices every Friday, during the warmer months, starting tomorrow. All standards welcome. 10 Ways to Use A Simulator article added to the Training, Simulators and the Ringing, Simulators menus. Winston Girling's report on the NW District Quarter Peal Week added to the page. Issue 13, Spring 2014 of the Guild Magazine, Awl a'huld added to the Guild Magazine page. Accounts & Independent Examiner's Report for 2013 added to the Accounts & Independent Examiner's Report page (on the Guild menu). Ruth Suggett's account of the Bardwell Practice Night Band and their tribute to Anthony Mitchell added to the News menu. Report of young ringers from St Mary's Kilburn's visit to Ipswich added to the Young Ringers' page. Revised Grant Terms & Conditions added to the Restoration menu. Neal Dodge's report on the Young Ringers' Practice at Clopton and Grundisburgh on Monady 17th February added to the Suffolk Young Ringers page. Draft GMC Minutes for 15/2/2014 added to the Guild, Minutes, Management Committee menu. Added Guild Peal Week page. A page of photos of Muriel Page's 60th anniversary peal added to the News menu. 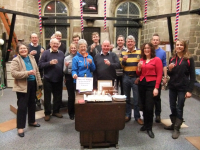 The Norman Tower ringers celebrated 100 years to the day since the birth of the diocese of St Edmundsbury and Ipswich on 21st January 1914. Neal Dodge's report on the Young Ringers' Practice at Otley on Sunday 17th November added to the Suffolk Young Ringers page. The guild now has a Twitter feed. 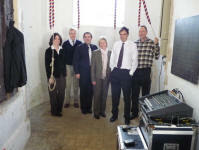 The first peal on the restored Clopton bells has been rung, by a Suffolk Guild band. Pictures of Young Ringers at Sproughton yesterday added to the Suffolk Young Ringers Page. Issue 12, Winter 2013 of the Guild Magazine, Awl a'huld added to the Guild Magazine page. Draft 2013 AGM Minutes added to the Guild, Minutes, Annual General Meetings menu. Draft GMC Minutes for 19/10/2013 added to the Guild, Minutes, Management Committee menu. Neal Dodge's report on the Young Ringers' Practice on Halloween added to the Suffolk Young Ringers page. There will be no ringing at Leiston, until further notice. Due to repairs needed to the tower. Suffolk Young Ringers page added to the News and Training menus. Approved Minutes of the GMC meetings held on 16th June 2013 added to the GMC Minutes page (On the The Guild, Minutes menu). November edition of the Association of Ringing Teachers newsletter added to the Training, Association of Ringing Teachers Newsletters menu. Draft minutes of the Belfry Advisory Committee meeting held on 17/9/2013 added to the BAC Minutes page. Printer friendly copy of November's What's On available to download. Clips of ringing at Lakenheath, St Margaret's Ipswich, Elmsett, Hunston, Felsham and Whepstead added to the Youtube Ringing Clips page. Clips of ringing at Eye, Ipswich, St Clement, Ipswich, St Mary at the Quay and Ipswich, St Nicholas added to the YouTube Ringing Clips page. Youtube clips of ringing at Brandon and Eriswell added to the YouTube Ringing Clips page. Minutes of the Belfry Advisory Committee meetings held on 14/5/2013 added to the BAC Minutes page. Ruth Suggett's account of Learning the Ropes at Bardwell added to the News and Training menus. Pictures added to Richy's blog for Thursday 1st, Friday 2nd & Monday 5th August. Photos added to Richy's Blog for Sunday 28th July, Monday 29th July, Tuesday 30th July, Wednesday 31st July and Saturday 3rd August. Printer friendly copy of September's What's On available to download. August edition of the Association of Ringing Teachers newsletter added to the Training, Association of Ringing Teachers Newsletters menu. Draft Minutes of the GMC meetings held on 16th June 2013 added to the GMC Minutes page (On the The Guild, Minutes menu). A page of YouTube clips of ringing in Suffolk added to the Ringing menu. Issue 11, Summer 2013 of the Guild Magazine, Awl a'huld added to the Guild Magazine page. Report of the Central Council Annual Meeting added to the News menu. Photos added to Richy's Blog for 6th, 21st, 22nd and 25th July. Ringing has been stopped at Cotton until a structural engineer has inspected the tower. The Suffolk Youth team came 3rd= in the Ringing World National Youth Contest in York on Saturday. Listen to their performance. Derek Rose's report on the SW District Striking Competitions added to the News menu and to the Ringing, Competitions menu. Approved Minutes of the GMC meetings held on 16th February 2013 added to the GMC Minutes page (On the The Guild, Minutes menu). Winston's report and full results for the NW District Striking Competition & BBQ added. Photos added to Richy's Blog for Friday 7th. Photos (full results to follow) from the NW District Striking Competition added to the News menu and to the Ringing, Competitions menus. Ruth Munnings' report on the SE District Striking Competitions added to the SE District Striking Competitions page. Pictures added to the NE District Striking Competition page. Minutes of the Belfry Advisory Committee meetings held on 27/9/2012 and 4/2/2013 added to the BAC Minutes page. Draft Minutes of the GMC meetings held on 16th February 2013 added to the GMC Minutes page (On the The Guild, Minutes menu). Printer friendly copy of May's What's On available to download. Page of photos from the 1974 AGM added to the News menu. Do you know who they are? NW Quarter Peal Week page added to the News menu. Issue 10, Spring 2013 of the Guild Magazine, Awl a'huld added to the Guild Magazine page. Stephen Cheek has a piece of ash, suitable for stays, for sale. Updated Membership Application Form added to the Membership menu. Updated Gift Aid Form added to the Membership menu. Helmingham added to the list of simulators. Printer friendly copy of April's What's On available to download. Accounts & Independent Examiner's Report for 2012 added to the Accounts & Independent Examiner's Report page (on the Guild menu). Minutes of the GMC meeting held on 20th October 2012 added to the GMC Minutes page (On the The Guild, Minutes menu). Howard W Egglestone, Ringing Master of The Suffolk Guild 1969 - 1974, died early yesterday. Issue 9, Winter 2012 of the Guild Magazine, Awl a'huld added to the Guild Magazine page. Minutes of the Belfry Advisory Committee meetings held on 16/6/2011, 22/9/2011, 9/2/2012 and 24/5/2012 added to the BAC Minutes page. Photos of Fornham All Saints and Fornham St Martin added to tower pages, photo pages and gallery. Photos courtesy of Neal Dodge. Ambrin William's report on the ITTS Module 1 Course at Reydon added to the News, ITTS Courses and Training, ITTS Courses menus. Notice of the Rod Pipe Commemoration Week End on the weekend of 12 & 13th October 2013 added to What's On. Ringing at Orford has been suspended until a crack in a tower buttress has been repaired. Draft Minutes of the GMC meetings held on 20th October 2012 added to the GMC Minutes page (On the The Guild, Minutes menu). Minutes of the GMC meetings held on 18th February 2012 and 17th June 2012 added to the GMC Minutes page (On the The Guild, Minutes menu). St Mary-le-Tower is now ringing on twelve again. Ruthie and Richy's wedding and honeymoon photos added to Richy's Blog for 11th, 13th, 14th, 15th, 16th, 17th, 18th & 19th August. Printer friendly copy of October's What's On available to download. Photo of the peal band, which rang the first peal on the twelve at The Norman Tower, added to Richy's Blog for Saturday 25th August. Issue 8, Summer 2012 of the Guild Magazine, Awl a'huld added to the Guild Magazine page. Photos added to Richy's Blog for Wednesday 15th August. Revised instructions and components sheets for The Vestey Ring added. Tom Scase's report of the SE District Quarter Peal Evening added to the News and Ringing menus. The Guild now has a stock of pre-stretched Terylene bell rope as well as synthetic hemp. Neil Dodge's report on the Young Ringers' Outing added to the News menu. Summer Specials added to the Suffolk Guild Clothing range. Up-to-date Gift Aid Form added to the Membership menu. There will be no practice at St Mary-le-Tower tomorrow, the 16th. Route map and final details of the NW District Cycle Tour on Saturday 14th July added to What's On. Photos added to Richy's blog for Friday 29th June, Saturday 30th June and Sunday 1st July. David Salter's photos added to Jed's report on the National Youth Striking Competition. Jed's report on the National Youth Striking Competition added to the News menu. Printer friendly copy of July's What's On available to download. Jed's report on the ITTS course held in the Cathedral on 9th June added to the Training and News menus. Pictures and links added to Richy's blogs for Saturday 2nd June, Sunday 3rd June, Monday 4th June and Thursday 7th June. Pictures of Mystic Bellydance (and The Vestey Ring) at Bruisyard Jubilee Fete added to the Diamond Jubilee and Vestey Ring pages. Results and photos of the Guild Striking Competitions added to the News menu. Practice at St Mary-le-Tower as usual on Bank Holiday Monday, 7th May. Three promotional banners are available to use in conjunction with The Vestey Ring, or by any tower which has a need for some eye-catching promotional material. Link to the Central Council President's blog added to the News menu. Issue 5, Issue 6 and Issue 7 (Spring 2012) of the Guild Magazine, Awl a'huld added to the Guild Magazine page. NW District Quarter Peal Week page added to the News and Ringing menus. Link to the CCCBR Ringing for the Olympic Games page added to the News and Ringing menus. Mandy Shedden's account of the dedication of the Norman Tower's new trebles added to the News menu. Video of Saturday's ringing at Theberton added to Richy's Blog. Trustees' Annual Report for 2011 added to the Trustees' Annual Reports page (on the Guild menu). Accounts & Independent Examiner's Report for 2011 added to the Accounts & Independent Examiner's Report page (on the Guild menu). Minutes of the GMC meeting held on 15th October 2011 added to the GMC Minutes page (On the The Guild, Minutes menu). The dedication of The Norman Tower's two new trebles on Easter Sunday 8th April will be broadcast live by Radio Suffolk. A page of Hugh Spink's photos of the NE District Walking Tour in Norwich added. Minutes of the GMC meeting held on 18th February 2012 added to the GMC Minutes page (On the The Guild, Minutes menu). A page of Giles Croucher's photos of the NE District Walking Tour in Norwich added. The two new trebles for the Norman Tower will be dedicated by Bishop Nigel at the Festal Eucharist service on Easter Day. This will be the last chance to see the bells on the ground and for many a unique opportunity to take part in a service where the bells are visible. Diamond Jubilee page added to the News menu for you to record your celebrations. Account of Frank Bloomfield's ringing on the occasion of his 84th birthday added to the News menu. BellBoard has been put up as a substitute for Campanophile. Printer friendly version of February's What's On uploaded to What's On page. Two new styles added to the range of Suffolk Guild clothing (sleeveless fleeces, in both men’s & women’s fit). Printer friendly copy of January's What's On available to download. More info. added to Two new Trebles for Bury St Edmunds page. Suffolk Guild Clothing page added: Buy now for Christmas. Report of the South-east District Quarter Peal Fortnight added News and Ringing menus. Minutes of the GMC meeting held on 19th June 2011 added to the GMC Minutes page (On the The Guild, Minutes menu). Pictures of Basildon's glass bell tower added to Richy's Blog for Saturday 24th. John Taylor's article about Helmingham Bells added to the News and Restoration, Restored Towers menus. Printer friendly list of 20 towers for the Elmsett Tower Open Day available to download. Bacton & Stowmarket practice nights: Bacton on 2nd Wednesdays. Stowmarket on 4th Wednesday (not December). Mandy Shedden's report on the casting of the two new trebles for The Norman Tower added to the News and Restoration, Restored Towers menus. Elsie Braybrook of Polstead died on Thursday 8th September. She had celebrated her 91st birthday in August. The funeral will be held at Polstead on Monday 19th September at 11am. Pictures added to Richy's Blog for Sunday. Picture of the Treasure Hunt Team added to Richy's Blog for 3rd September. There will be no practice at Offton on Tuesday 13th September. Latest edition of the Guild Library Catalogue added to the Resources menu. Added a page of photos taken at the Guild Social. Added Bailey Brothers of Leiston page. Halesworth practice on Tuesday 2nd August will be at Blythburgh. John Taylor's report on Debenham Day of Bells added to the News menu. Independent Examiner's Report and Accounts for 2010 added to the Independent Examiner's Report 2010 page. The Norman Tower Ring Appeal raised £825 towards the augmentation. Halesworth practice on Tuesday 26th July will be at Wenhaston. The Norman Tower practice on 26th July cancelled. This is due choir recording in Cathedral. Alternative venue The Folly at Claydon. 7.30 - 9pm. A set of handbells is for sale on ebay. Please click on this link if you are interested. Woodbridge bells will be out of action until the end of September, at least. This is due to tower repairs. Shawn Kholucy's plea to repair timber bell frames added to the Restoration, Bell Frames menu. Offton practices resumed on Tuesday 28th June. Minutes of the Belfry Advisory Committee meetings held on 30/9/2010 and 10/2/2011 added to the BAC Minutes page. Photos added to the Guild Striking Competition page. Veterans' Day (Wednesday 13th July) added to What's On. Minutes of the GMC meeting held on 19th February 2011 added to the GMC Minutes page (On the The Guild, Minutes menu). Veronica Downing's notes on the Central Council meeting added to the CCCBR Meeting page. July's What's On available to download. Pictures of croquet added to Richy's Blog for 11th June. I now believe everything on the web site is working. If anything is not working please let know. The Norman Tower Ring Appeal Grand Draw Prize Winners List has been added to the News menu. Note who won first prize; one of the Guild's newest Life Honorary Members! The web site has been moved to a new server. At the moment the Guest Book is not working. Neither are there any email addresses on the Contacts page as email forwarding is not working. I hope to restore everything over the next few days. If anything, other than those mentioned, is not working please let know. A version of a talk on Bellframes: Replace or Repair? has been added to the Restoration menu. A report on the NW District Striking Competition added to the News and the Ringing, Competitions menus. Instructions for erecting The Vestey Ring added to the Vestey Ring page. Report of the Central Council Annual Meeting in Hereford added. The first quarter peal on The Vestey Ring was scored today. More details of the Guild Summer Social added to What's On. Jed Flatter's report on the Guild Striking Competitions added to the web page. June's What's On available to download. Minutes of the GMC meeting held on 16th October 2010 added to the GMC Minutes page (On the The Guild, Minutes menu). Jed Flatters was elected as Ringing Master and Richard Munnings as PRO at yesterday's AGM. Royal Wedding Ringing page added to the News menu. May's What's On available to download. Issue 4 of the Guild Magazine, Awl a'huld added. Norman Tower Grand Draw page added to the News and Restoration menus. (In aid of the Ring Appeal). April's What's On available to download. Richy's report on Guild Peal Week 2011 added to the SGPW 2011 page. St Mary-le-Tower practice on 21st February cancelled. Date of Guild Social changed to Saturday 30th July. Three peal attempts added to the Guild Peal Week 2011 page. January's What's On available to download. Richy's report on the St Edmund's day celebrations added to the News menu. There is an article about the Rendham Ringers in the December issue of EADT Suffolk magazine. Suffolk Guild Feature on BBC Suffolk website. Issue 3 of the new Guild Magazine, Awl a'huld added to the News menu. December's What's On available to download. Issue 2 of the new Guild Magazine, Awl a'huld added to the News menu. Report on the SE District Quarter Peal Fortnight added to the News and Ringing menus. NW District Social on 11th December will now be at Rougham. The Guild library now has a DVD of The Ringing World from 1911 to 1940. Minutes of the GMC meeting held on 15th August 2010 added to the GMC Minutes page (On the The Guild, Minutes menu). Triples from Scratch on Sunday 31st October will be at Boxford. List of R&T Committee members added to the Training menu. Pictures of the dedication of the Vestey Ring in the cathedral added to the web page. Minutes of the BAC meeting held on 1st July 2010 added to the The Guild, Minutes menu. Link to the Heritage Lottery Fund added to the Restoration menu. The Guild has taken delivery of the Vestey Ring. The mini-ring's first outing will be to the Henham Steam Rally on 18/19 September. Minutes of the BAC meeting held on 4th February 2010 added to the The Guild, Minutes menu. Guild Peal Week 2011 page added to the News menu. Minutes of the GMC meeting held on 20th February 2010 added to the The Guild, Minutes menu. Pictures from the Young Ringers' Event added. Taken after last night's quarter at Pettistree to celebrate Richard and Ruth's engagement. Ruth Suggett's report on the NW District Striking Competition added to the Ringing, Competitions menu. July's What's On available to download. A copy has also been emailed to all Guild members. If you do not wish to receive What's On by email each month please let or know. Link to pictures of the repairs at Hollesley added to the Restoration menu. David Salter's and Richard Munning's reports on the Centarl Council AGM in Derby added to the News menu. Minutes of the GMC meeting held on 17th October, 2009 added to the The Guild, Minutes menu. Report and results for the Guild Striking Competitions added to the News and Ringing, Competitions menus. Mandy Shedden's account of the NW District Quarter Peal Week raising money for Help for Heroes added to the News menu. Ruth Suggett's report on the NW District Quarter Peal Week added. Results of NE District Striking Competition added to the News menu and the Ringing, Competitions menu. The practice advertised for Elveden this Wednesday (5th)will now be held at Bardwell. Result of SE District Striking Competition added to the News menu and the Ringing, Competitions menu. Draft Minutes of the 2010 Annual General Meeting have been added to the The Guild, Minutes, AGM menu and to the AGM 2010 page. On Sunday, 25th April Katharine & David Salter rang their 1000th peal together. This makes them the first Suffolk born couple to reach this milestone. Katharine was born in Sudbury and David near Leiston. Interestingly Alan Mayle who rang the tenor was also born in South West Suffolk at Clare. Another coincidence is that all five ringers are Picesian. Ruth Suggettsl report and photo of the Ixworth Dedication today added to the Restoration and News menus. May's What's On available to download. A copy has also been emailed to all Guild members. If you do not wish to receive What's On by email each month please let or know. Helmingham – A Special Place in History page added to News menu. NW District Quarter Peal Week page added to News and Ringing menus. The Annual Report has now been published. All Guild members should be receiving their copy very soon. Issue 1 of the new Guild Magazine added to the News menu. Diary inserts (NE, NW, SE, SW) for each district's What's On added to the What's On pages (NE, NW, SE, SW). Minutes of the 2009 AGM added to the The Guild, Minutes menu. Poster & details of Faure's Requiem & Vivaldi's Gloria from Scratch on Sunday 2 May added to What's On. The last peal on the Campsea Ashe bells prior to restoration and augmentation was rung yesterday. Poster for the Heritage & Restoration Seminar added to What's on. Richy's report on Guild Peal Week added. Wednesday's practice at Elevden will take place at Bardwell. The first QP of Spliced Surprise Major was rung by a resident North East District band in living memory, to celebrate Don Price's 80th birthday. Photo of Henry Salter's first peal band added to Wednesday's blog. February 2010 Campsea Ashe Bells Project Newsletter added to the News, Campsea Ashe Newsletters menu. March's What's On available to download. 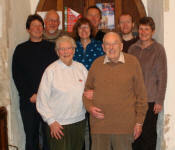 Don Price's 80th Birthday page added to the News menu. Yesterday a peal of 5080 Spliced Caters was rung at Grundisburgh to celebrate Don's 80th birthday. List of Peal Attempts added to the Guild Peal Week page. The first peal on the restored bells at Fressingfield was rung yesterday. 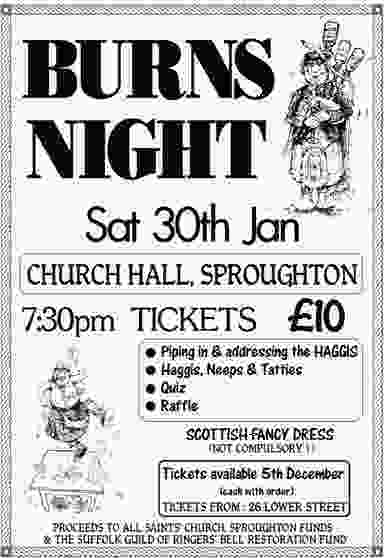 Burns Night at Sproughton Church Hall on Saturday 30th January added to What's On. Re-dedication of the bells at Dennington on Sunday 31st January added to What's On. News of the re-hang at Dennington added to the Dennington Re-hang page. February's What's On available to download. NW District programme for 2010 added to What's On. Contact details for the SE District Treasurer added to the Contacts page. NE District programme for 2010 added to What's On. Picture of Peter Schurr's 89th Birthday quarter peal band added to Richy's blog (9/12/2009). On Monday 28th a quarter of 1250 Cambridge Minor was rung, at Pettistree, to celebrate Mike and Lorna Whitaker's Golden Wedding. This was Mike's 100th quarter on the bells and also the 550th quarter peal on the bells since the re-hang in 1986. Guild Library Catalogue for 2010 added to website. Next Tuesday, the 22nd December there is a 2.30pm Crib Service at SMLT and ringers would be much appreciated from 2-2.30pm. On Christmas Eve, we are ringing from 6-7pm for the Carol Service at SMLT. If you want seats reserving for the service then please let either me, Owen or Diana know. There should be handbell ringing. I'm not sure if that tempts you or puts you off! It should be nice. On Christmas Day itself, after much discussion, we've decided we will be ringing from 9.45-10.30 at SMLT. As an aside, help would also be appreciated at St Nicholas as ringing is wanted 6-6.30pm tomorrow (Wednesday, 16th December) for a Carol Service there. If you can make any of those dates then ideally could you (01394 389354 or 07934 445232) so we get an idea of where we're at, though not letting me know doesn't preclude you from turning up! Handel's Messiah from Scratch on Sunday 13th December has moved to Hacheston church. Click for the poster. Christening picture of Mason added to Richy's blog. SW District program for 20010/11 added to What's On. SE District program for 20010/11 added to What's On. Link to English Heritage: Bells and Bell frames: Guidelines for consultation added to the Restoration menu. St Mary's Hadleigh is closed for ringing for some weeks whilst repairs are carried out. December What's On available to download. Amanda Richmond - Destination 8850m. Amanda will be giving an illustrated account of this wonderful achievement on Thursday November 26. See What's On. The Marlesford Monthly Practice on Tuesday 10th has been cancelled because the church is still being lime-washed and the tower is inaccessible. The 'Condition' of Harkstead bells changed to 'Good going order'. The first quarter peal was rung on the restored bells at Wissett, yesterday. Taylors Eayre & Smith was sold to UK Bell Foundries Limited on Friday. Minutes of the GMC meetings held on 28th February, 2009 and 21st June, 2009 added to the Minutes menu. November What's On available to download. There is a piece about Taylors Earye & Smith on the Telegraph website. Richy's note on simulators added to the Ringing menu. Photo of first mini-ring peal band added to Mini-Ring page. Campsea Ashe Restoration page added to the Restoration menu. May 2009 & July 2009 Campsea Ashe Bells Project Newsletters added to the News, Campsea Ashe Newsletters menu. Belfry Advisory Committee minutes for 11/6/2009 added. Mandy Shedden's report on the dedication of Bardwell bells added to the News menu. The first peal on the Suffolk Guild mini-ring was rung today at Moats Tye. Huntingfield practice night is now 6 - 7pm (new time) on Mondays. The Guild now has a supply of Terylene™ (polyester) rope for sale. It has been reported that Taylors, Eayre and Smith have called in administrators. September issue of the Guild Newsletter added to the News, Guild Newsletters menu. Video of St Lawrence's bells being rung after the rehang. Listen to Trevor Hughes talking (starts at 8 min 21 sec) about Aldeburgh bells at on yesterday's Farming Today (BBC Radio 4). The practice at Ixworth this Tuesday, 8th September is cancelled because of repairs to tower steps. September What's On available to download. Halesworth practices in August will be at Blythburgh (11th), Stradbroke (18th) and Chediston (25th). There will be no Friday practices at Wenhaston and Chediston in August. Everything returns to normal in September. Pictures of the new Bardwell treble going in added to the Bardwell Re-hang page. Ringing in Circles: A new method was named at Grundisburgh on Saturday morning, Roncobello Place Minor (34.16x1236x1236x16x16.34.16). This is the first cyclic minor method rung in Suffolk. A quarter peal was rung: 1440 Roncobello Place Minor. More to follow from James Smith. Photos of Dennington bells coming out of the tower added to the Dennington Re‑hang page on the Restoration menu. Richy's report of the National 12-Bell Final added to the News menu. David Salter's report on the Central Council Meeting at Worcester added to the News menu. Jack Banks Memorial Quarter added to News menu. 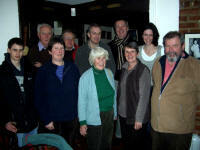 Link to Mandy Shedden's report and pictures of the Guild Social added to the News menu. Pictures of the new Bardwell bells added to the Bardwell Re-hang page. Banks JOHN WILLIAM (Jack) peacefully on 15th June 2009, aged 101, dearly loved husband of the late Dorothy (Dot), dear father of Jill and father-in-law of Ian. Proud grandfather of Fiona and Elspeth and loving great grandpa of George, Orla, Madeleine, Theo, Phoebe, Barnaby and Oscar. A service of Thanksgiving for his long life will be held at St Mary's Church, Bury St Edmunds on Friday 26th June 2009 at 1.30pm. Donations, if desired, to St Mary's Church, may be sent c/o L. Fulcher, 80, Whiting Street, Bury St Edmunds, IP33 1NX. Jack was a Life Honorary Member of the Suffolk Guild. Link to the NW District Fun Website added to the Resources, Links menu. Revised Grant Protocol added to the Restoration menu. Glenys Fear's report on the Campsea Ashe Ringing Festival added to the Ringing menu. Suffolk Guild Mini-Ring page added to the Ringing menu. Suffolk Guild Mini-Ring also added to the Towers list. Belfry Advisory Committee Minutes for 6th February 2009 added to the Minutes menu. Latest episode in the re-hang at Bardwell added to the Restoration menu. Richy's report on the Central Council Meeting at Worcester added to the News menu. Report on the BBC East Big Skill Award 2009 (Lesley Dolphin learns to ring) added to the Ringing menu. Amanda has climbed Everest: see the Guest Book. Report on the Guild Striking Competitions added to the Ringing menu. Membership Certificate poster added to the Membership menu: how to obtain one. Photo of the winning team added to the NE Striking Competition results. Report on the new headstock for All Saints, Sudbury added to the Restoration and News menus. Photos added to Report on the North West District Visit to Worcester Cathedral Teaching Centre. Report on the North West District Visit to Worcester Cathedral Teaching Centre added to the News menu. Note about Susan & Peter Schurr's Diamond Wedding celebrations added to the News menu. Results of the SE District Striking Competition added to the Ringing, Completions menu. Hollesley & Friends Outing page added to the Ringing menu. Munnings: Master or monster? See today's EADT, p54. May What's On available to download. Report of presentation to Albert Driver added to News menu. North West District Quarter Peal Week page added to Ringing menu. Halesworth are now ringing on eight bells again! Sponsored Peal Attempt at Mandurah, Western Australia added to News menu. Report of the first peal on the Ixworth eight added to the Ringing menu. Leiston tower is restarting practice nights after many years. The first will be in Easter Week, Wednesday 15th April. Thereafter practice nights will be on the 2nd Wednesday of the month from 13th May. Please support! Rules for the SW District Striking Competition added to What's On (25th April). Open Tower Day at Felsham on Saturday 11th April added to What's On. April What's On available to download. Rendham practices resume on Fridays from 6.00 to 7.00 p.m. Yesterday the 1st peal on the rehung Chediston bells was rung. March issue of the Guild Newsletter added to the News, Guild Newsletters menu. Link to The Changeringing Wiki added to the Links page on the Resources menu. Draft minutes of the 2008 AGM added to the Minutes menu. Minutes of the GMC meeting held on 18th October, 2008 added to Minutes menu. Ruth Young is scheduled to be on Radio Suffolk at 8.50 a.m. on Tuesday 3rd March in connection with Hopton bells. Grant Protocol added to the Restoration menu. NE District Quarter Peal Fortnight page added to the Ringing menu. Pictures of the bells coming out at Bardwell added to the Restoration menu. Wissett bells have attracted a grant of £50,000 from The Heritage Lottery Fund towards the cost of re-hanging the bells- reported in the EDP, today. Campsea Ashe tower Open Morning on Saturday 7th March added to What's On. Belfry Advisory Committee Minutes for 10th October 2008 added to the Minutes menu. Report of Muriel Page's 55th anniversary peal added to the Ringing menu. Report of Ian Holland's 70th birthday peal attempt added to the News menu. Venue for SW District Practice on Saturday 25th July changed to Highham. February's What's On available for download. Date of Guild Management Committee meeting changed to 28th February. There will be a Monthly Practice at Marlesford on Tuesday 13th January. Mid-Week Ringing will be at Ixworth and Packenham on Tuesday 10th February. 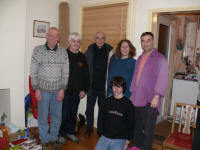 Pictures of New Year's Eve activities added to the Ringing Master's blog. Picture of St Mary-le-Tower's wooden clapper added to the Ringing Master's blog for 8th December 2008. Taylors Eayre & Smith's flyer about wooden clappers added to the Ringing Master's blog for 13th October 2008. Link to a note about reclaiming VAT added to the Restoration menu. Printer friendly versions of the NE, NW & SE Districts' programmes added to the News, What's On menu. Available either A4 size or as a diary insert (A6). SW District to follow soon. Venue for SW District practice on 24th January changed. Halesworth Bells' News added to the News menu. Weekly practices will resume at Ixworth from Tuesday 9th December. We will aim to practise with beginners between 7.15 and 8pm then others 8 till 9pm. Everyone welcome but please let us know if you are coming, if you can! Contact: , 01359 251896. Pictures added to Debenham Ringers' Walk report. All twelve bells are ringing again at St Mary-le-Tower. John Taylor's report of the Debenham Ringers' Walk added to the News menu. Report on the Palgrave Centenary Peal added to the Ringing menu. Ten Good Handling Tips added to the Resources, Ringing Tips menu. Tutors' Notes: Handling Faults added to the Resources, Ringing Tips menu. December's What's On available for download. Messiah from Scratch on Sunday 14th December at Campsea Ashe church is not far away now. To sign up: Contact: . Poster. In aid of the Campsea Ashe Bell Restoration. Progress with the re-hang at Ixworth added to the Restoration menu. A video of the BBC East Inside Out feature on bellringing is available from the Guild library. There will be an article about bellringing and the Hollesley simulator in tomorrow's (Tuesday) East Anglian. General Management Committee minutes for 16/2/2008 and 22/6/2008 added to Minutes menu. Report of Maurice Rose's Retirement Peal added to the Ringing menu. Link to the Ixworth Bell Restoration website added to the Ixworth tower page. Report of Susan Schurr's 65th Birthday Quarter, her first on 8, added to the Ringing menu. Mid-Week Ringing on Wednesday 12th November will be at Hollesley. The Ringing Master's Blog is one year old today. Report of two North-West District first quarter peals added to the Ringing menu. Mid-Week Ringing at Stoke-by-Nayland is on Wednesday 12th November. Full details of the NW District visit to Worcester Cathedral Teaching Centre on Saturday 9th May 2009 added to What's On. BBC1 Inside Out will be showing the activities of Hollesley ringers and friends on Wednesday 5th November at 7.30pm. November's What's On available for download. Message from Kathleen Ben Rabha, coordinator for The White Ribbon Campaign added to the News menu. Belfry Advisory Committee minutes for 13th June 2008 added. A Peal Attempts page has been added to the News menu. If you would like a peal attempt listed, please it to Chris Garner. New final paragraph and quarter peal report added to Maurice Rose: Man & Boy. Albert Driver's latest quarter peal at Redgrave added to the Ringing menu. Twin-Hunt Minor Methods page by James Smith added to the Ringing and News menus. September 2008 Campsea Ashe Bells Project Newsletter added to News, Campsea Ashe Newsletters menu. 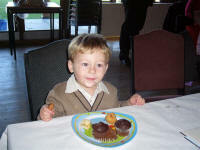 Maurice Rose: Man & Boy added to News menu. October's What's On available for download. Bells and Moonshine A Mysterious Mardle on Monday 22nd September at Easton and Leatheringham Village Hall added to What's On. 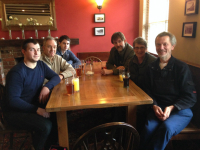 Tom Scase's account of the Debenham Ringers' cycle outing added to the News and Ringing menus. Bruce Wakefield's account of the Woodbridge ringers taking part in a performance of Tchaikovsky’s 1812 Overture added to the News and Ringing menus. Bruce Wakefield's report of the Woodbridge Ringers BBQ added to the News menu. Claire Monk's Lundy Island trip Report added to the News menu. Congratulations to Robert Beavis who, at Ashbocking on Friday 22nd August, rang his first peal. The Dennington Church Bell Appeal has received a donation of £25,000 from Baroness Alison Fowke. This brings the fund to £64,000, including a donation of £6,000 from The Suffolk Guild. September's What's On available for download. Report of 40th Wedding Anniversary quarter peal added to the Ringing menu. No practice at Marlesford tonight. Second Tuesday practices resume on September 9th. Report of Halesworth Quarter Peal added to the Ringing menu. July 2008 Campsea Ashe Bells Project Newsletter added to News, Campsea Ashe Newsletters menu. Stephen Pettmans' report on the visit of Scuola Campanaria Roncobello to Suffolk added to the News menu. Concert by Scuola Campanaria Roncobello led by Luca Fiocchi in Grundisburgh church at 8.00 p.m. on Friday 25th July. August's What's On available for download. There will be no practice at Marlesford on Tuesday 12th August. Belfry Advisory Committee minutes for 8th February 2008 added to the Minutes menu. Chediston Old Time Farming Day, on 19th July, added to What's On. Campsea Ashe Ringing Festival report added to Ringing menu. At the Guild Management Committee meeting on Sunday (22 June) Winston Girling announced that he is stepping down as Guild Bells Adviser and Chairman of the Bells Advisory Committee, the latter after 16 years in the post. I'm sure that everybody is most grateful to Winston for the huge amount of work he has done over the years in assisting with a very large number of restoration projects. A more detailed tribute will appear in due course. I am pleased to report that the Guild Executive has appointed Jonathan Stevens to replace Winston in both roles, at least until the next AGM. Mary Dunbavin rang her 1,000th peal today at Horringer. Ringing at Ufford starts again on Sunday 22nd June followed by Tuesday practice (not 2nd) as before. Details of the Ridgman Trophy team added. Church bells could be silenced - East Anglian News item about Aldeburgh church bells. See also today's Times: p25. Bells at church may be silenced - BBC News item about Aldeburgh church bells. A Report on the NW District Striking Competition has been added to the Ringing, Competitions menu. Pakenham practice on Friday 6th June is cancelled. Two reports, one serious, one more light-hearted, on the Central Council Annual Meeting added to the News, CCCBR Annual Meeting Reports 2008 menu. Ringing at Buxhall suspended until further notice because of building work. Practices will take place at Great Finborough. Report of Delia Golding's first quarter peal, rung at Buxhall, added to News menu. Concert at Bardwell on Friday 4th July added to What's On. There will not be a practice at St Mary-le-Tower on Monday 26th May. Practices continue, as usual, from Monday 2nd June. A Report on the Guild Striking Competitions has been added to the Ringing, Competitions menu. Report on the start of the Ixworth Restoration added to the News menu. Details of the SE District Outing to North Essex on Saturday 7th June added to What's On, including a downloadable poster. May 2008 Campsea Ashe Bells Project Newsletter added to News, Campsea Ashe Newsletters menu. A Report of the NE District Striking Competition has been added to the Ringing, Competitions menu. Practice at the Norman Tower cancelled on Tuesday 13th May only. Maggie Wolverson was elected Chairman of the North-East District on Saturday 10th. A Report of the SE District Striking Competition has been added to the Ringing, Competitions menu. From 6th May 2008, Ufford practices will take place at Marlesford. BBC Inside Out showing ringing at Hollesley postponed to the next series, starting in September. BBC East at filming All Saints, Hollesley page added to News menu. Downloadable version of May's What's On added to What's On. Details of NW Quarterly Meeting & Practice at Great Finborough & Buxhall on 10th May added to What's On, including a downloadable flyer. Details of the SE District Outing to Cambridgeshire on 19th April added to What's On, including a downloadable poster. Our New Chairman page added to The Guild and News menus. Some older News and Ringing items moved to a new Archive page. Report of NW District Quarter Peal Week added to the News menu. Report of Hollesley Outing to Somerset in March added to the News menu. Trustees' Annual Report added to the The Guild menu. Independent Examiners' Report added to the The Guild menu. Ruth Suggett's report on The Last Peal at Ixworth added to the Ringing menu. 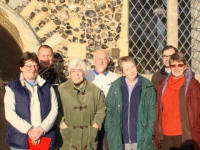 Stephen Pettmans' report on the visit of Bologna ringers to Suffolk added to the News menu. Christine Knight's report of the Guilds 85th Anniversary Dinner added to the site. January 2008 Campsea Ashe Bells Project Newsletter added to News, Campsea Ashe Newletters menu. Minutes of the Annual General Meeting, April2007 added to the Minutes, Annual General Meetings menu. March 2008 Campsea Ashe Bells Project Newsletter added to News, Campsea Ashe Newletters menu. 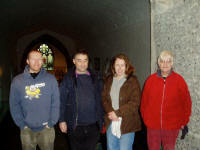 Visit of Bologna ringers to Suffolk added to News menu. Gislingham Variety Club's production of Anything Goes on Wednseday 26th March added to What's On. Evensong and dedication of the rehung bells at Stradishall on Sunday 13th April added to What's On. There will be no ringing at Gislingham on Wednesday 26th March. The AGM will be held at 5.45pm on Saturday 5th April - see What's On for details. General Management Committee minutes for 17th June 2007 added to Minutes menu. The next Mid-week Ringing will take place on Wednesday 12th March at Polstead. Proposed Constitution & Rule changes for the AGM added to the AGM 2008 page on the The Guild menu. Guild Peal Week 2008 report page added to Ringing menu. General Management Committee minutes for 17th October 2007 added to Minutes menu. 81 Years of Ringing (Albert Driver's 93rd birthday quarter peal) added to News menu. Belfry Advisory Committee Minutes for 19/10/2007 added to the Minutes menu. St Mary-le-Tower, Ipswich withdraw form the National Twelve Bell Striking Contest. The SW District Practice on March 29th will now be at Edwardstone, while the Practice on October 25th will be at Hadleigh. Menu for the Guild 85th Anniversary Dinner on Saturday 15th March added to the News menu. 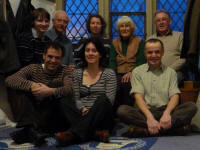 Tostock Young Ringers' Practices are continuing from Thursday 21st February. The contact is Becky Munford. Report of The University of The Third Age talk about Bells & Bell Ringing at Ixworth, given by George Pipe added to the News menu. Veterans' Day at Debenham on Wednesday 9th July added to What's On. Tostock Young Ringers' Practices have stopped for the time being. District Secretaries' Check List added to Information for new Guild and District officers menu on the Resources menu. Date of 85th Anniversary Dinner corrected in the Ringing Master's blog!! District Secretaries' Check List added to site. Managing External Pressures page added to Resources menu. Coping with External Pressure page added. Poster and Ticket Order Form for the Guild 85th Anniversary Dinner on Saturday 15th March added to What's On and to the News menu. 2008 Ringing Roadshow Poster and Leaflet added to What's On. Guild Library Catalogue for 2008 added to website. St Mary the Virgin, Gislingham: Report of the Dedication of the bells added to the News menu. Ringing Centres Seminars on 26/1/2008, 16/2/2008 & 19/4/2008 added to What's On. Tostock Young Ringers' Practice in January is on Thursday 17th. Yesterday (16th) the bells at Gislingham were rededicated by Bishop Nigel. Winter issue of the Guild Newsletter added. Practices at Marlesford will resume, on 2nd Tuesdays only, on 8th January 2008. Yesterday a peal was rung to mark the 100th birthday of John Banks who formerly rang at Bury St Edmunds. Details of ringing in December for the White Ribbon Campaign Against Gender Violence added to What's On. The Guild Ringing Master, Richard Munnings, was interviewed this morning on Rachel Sloane's Sunday Breakfast on BBC Radio Suffolk about ringing for The Campaign. The NE District Carol Service will be held at. Huntingfield. on Saturday 8th December. The Ringing Roadshow 2008 will be held at Stoneleigh Park on 5th & 6th September 2008. John Taylor's talk on The Church Tower and What’s In It – From Square One at St Mary the Virgin, Mendlesham on Friday 7th December added to What's On. Centre page spread in today's East Anglian Daily Times about Suffolk bellringers visit to Lundy. Belfry Advisory Committee Minutes from 22/1/1998 to 15/6/2007 added to the BAC Minutes page. Autumn & Summer issue of the Guild Newsletter added. Ringing at Burgh will re-start on Friday 26th October. General Management Committee minutes for 17th February 2007 added to GMC Minutes page. Campsea Ashe Bells Project Newsletter added to News menu. Stowmarket Public Open Tower Day on Saturday 1st December added to What's On. Mid-week Ringing in October is at Ufford. Change of date: The SE District Beginning Conducting course is on Saturday October 13th. Elveden Quarter Peal Report added to Ringing menu. Picture of Lundy Island Caters quarter peal band added to Lundy Island Trip report. Date of Guild Training Day changed to Saturday 20th October. Mid-week ringing on Tuesday 18th September is at Gislingham & Cotton. Campsea Bells Project Open Morning added to What's On. Guild Peal Week 2008 (9/2/2008 - 17/2/2008) added to What's On. Lundy Island trip Report added to Ringing menu. Practice at Rougham on Thursday 26 July 2007 cancelled. Suffolk Bells page added to Resources menu. NW District Striking Competition report added to Ringing, Competitions menu. 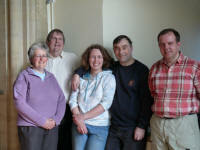 Photo of Suffolk Guild Ridgman Trophy Team added to Ridgman Tropy page. Young Ringers Summer Tour on Saturday 8th September added to What's On. Ridgman Tropy results added to Ringing, Competitions menu. NE District Striking Competition 2007 added to the Ringing menu. North West District Call Change Striking Competition at Bacton on Saturday 30th June added to What's On. Halesworth Local Band Peal 2007 added to the Ringing menu. Don's Summer Walk & Ring at Aldeburgh and Iken on Saturday 21st July added to What's On. Eight Bell Method Practice at the Norman Tower using the simulator on Wednesday 16th May added to What's On. North West District Quarter Peal Week Report added to Ringing menu. Burgh: The tower has been repaired. The scaffolding has been taken down. Ringing should start again in about six months, once the lime mortar has set. Mid Week Ringing at The Folly, Claydon on 15th May added to What's On. Mid Week Ringing at Gislingham on September 18th added to What's On. Poster for SE Outing to Norfolk (28th April) uploaded and details added to What's On. Added Mid Week Ringing at Ufford on Tuesday 17th to What's on. Spring issue of Newsletter added to Newsletter page. Details of Guild AGM on 14th April added to What's On page. Guild Training Day (13/10/2007; before the NW Annual Meeting) added to What's On. Guild Peal Week Report page added to Ringing menu. Go of bells added to Towers A to Z page. General Management Committee Minutes for 25th June 2006 added. 85th Anniversary Guild Dinner (15th March 2008) added to What's On. March What's On available to download. Practice Night at Long Melford, Holy Trinity is now Wednesday, 7.30 - 9.30 p.m. The Guest Book has been reinstated. Links to peal records added to all tower pages (where a peal has been rung). Winter issue of Newsletter added to Newsletter page. Ringing Practice will resume at Bramford on Tuesday 19th December. Ringing Practice will start at Henley on Tuesday 6th February. New Year's Day Ring & Walk at Offton and Claydon added to What's On. Christmas Ringing in Ipswich on Saturday 16th December added to What's On. Guild 10-Bell Practice on 10the March 2007 added to What's On. Ipswich has been drawn in the Kingston-Upon-Thames group of the 2007 12-bell eliminators. Website statistics page added to News menu. Guest Book added to Guild menu. Stowmarket Bell Ringing & Open Tower Day (2nd December) added to What's On. Guild Peal Week - Saturday 10th February - Sunday 18th February 2007 added to What's On. Some bell information added for nearly all towers, mostly from information provided by Alan Moult. Just click on the number of bells, top left of each tower page. e.g. Hacheston tower page. Hacheston bells page. Mid-week Ringing for Tuesday 5th December added to What's On page. Special 8 Bell Method Ringing Practice on Wednseday 15th November at the Norman Tower, Bury St Edmunds added to What's On. 175th church picture added to the website. Only 111 to go! Many thanks to Robert Clinton, Graham Downing, Chris Garner, Mary Garner, Kevin Griggs, Alan Moult, John Pereira, David Salter, Louis Suggett and John Taylor for providing the pictures. Link to The Children's Society Peal Appeal added to Links page. Autumn issue of Newsletter added to Newsletter page. Sevenoaks' ladies outing to Suffolk on Friday 27th October and Saturday 28th October added to What's On. November's What's On available to download. Please note that the NE District Practice is on Wednesday 1st November. Guild Training Day Report added. 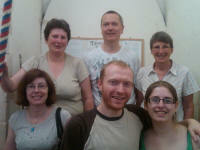 Contact for Tostock Young Ringers Practice is now Sarah Monk. 161st church picture added to the website. Only 125 to go! Many thanks to Robert Clinton, Graham Downing, Chris Garner, Mary Garner, Kevin Griggs, John Pereira, David Salter, Louis Suggett and John Taylor for providing the pictures. Kent Outing on Saturday 30th September added. Moving on to Caters & Royal postponed to Saturday 18th November at Grundisburgh. October's What's On available to download. Ringing Master's 'phone number updated. September's What's On available to download. Memorial Peal for John Blythe. Rose Trophy 8 bell striking competition results added. Mid-week Ringing for August added to What's On page. Photo of Offton church added. Young Ringers Outing added to What's On. Summer issue of Newsletter added to Newsletter page. General Management Committee Minutes for 18th February 2006 added. St Mary the Virgin, Parham: new ring of six dedicated. Details of SW District Car Outing added. Cambridge University Guild: 79 faults. Hertford County Association: 80 faults. Lincoln Diocesan Guild: 104 faults. Ely Diocesan Association: 111 faults. Peterborough Diocesan Guild: 111 faults. Sunday Service Ringing added to Tower pages. Parham Re-hang page added to News, menu. Belfry Advisory Committee Minutes added to Minutes, menu. Richard Munnings elected Ringing Master. Interactive maps added to Ringing, Maps menu for use over broad band connections. Downloadable version of What's On available. AGM Agenda added to Guild menu. Ixworth Open Day & Concert added to What's On. Mid-week ringing added to What's On. Insurance. Downloadable synopsis of policies on Membership menu. Grundisburgh There will be no practice at Grundisburgh on Thursday 13th April. Ringing will be at 5.30pm for the 6.00pm service. Revised Guild Website went live. Please send any comments, errors or omissions to me. Burgh: Ringing has stopped for the time being due to structural problems with the tower. It is hoped that an alternative practice venue can be arranged. Parham: The four new bells were cast by Taylors Eayre & Smith at Loughborough.